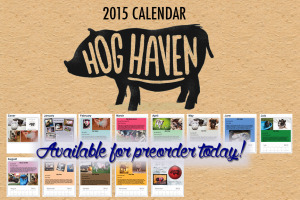 Our 2015 Calendar features more than 30 pigtures, plus fun facts about potbelly pigs! You don’t want to miss this great opportunity to support our organization–and calendars make great gifts for fellow piggy lovers! Visit our website for order information by clicking the image above. < Previous Pumpkins…the fall treat for potbellied pigs! Next > Ugly Sweater Challenge – For Your Animal Friends!